Tesla astroturfs, Softbank flexes, BMW and Daimler hookup, What is a Jelbi? Welcome back to the TechCrunch transportation newsletter; I’m your host Kirsten Korosec, senior transportation reporter at TechCrunch. This is the third edition of our tome, I mean newsletter, and this week let’s settle in for a mind meld on why logistics is the new Hansel, a curious Tesla subsidiary, and discover a new mobility species called the Jelbi. Never heard of TechCrunch’s Transportation Weekly? Catch up here and here. As I’ve written before, consider this a soft launch. Follow me on Twitter @kirstenkorosec to ensure you see it each week. (An email subscription is coming). This week, Mark Harris is back with a story about Tesla. This focuses on the company’s energy business, or more specifically, the opaqueness around its lobbying efforts in the energy sector. Follow him on Twitter @meharris. Yes, this is a transportation newsletter. We get it. But Tesla has long pushed itself as a sustainable energy company that covers the entire ecosystem — solar power, energy storage, and electric vehicles. We’ll continue to look through the dozens of Tesla subsidiaries, most of them related to solar, to see what else pops up. In other Tesla news, ARK Invest has CEO Elon Musk on a podcast; Tesla files its 10K, Consumer Reports pulls its recommendation for the Model 3 and data firm JATO Dynamics declares that the Tesla Model 3 was the best-selling electric car in the world in 2018. This week, I wanted to highlight a recent conversation with May Mobility co-founder and COO Alisyn Malek. 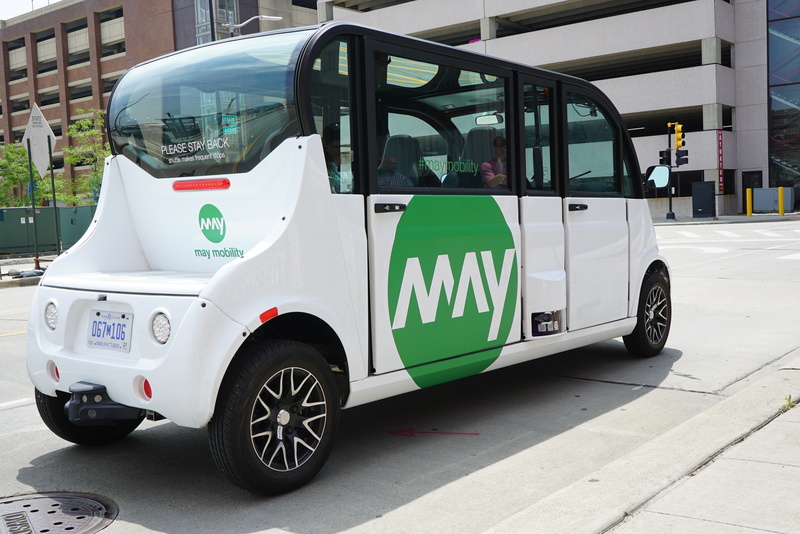 May Mobility, an autonomous shuttle company, announced last week a $22 million funding round. This week, the company started testing its third AV shuttle service; this time, it’s in Rhode Island. May Mobility’s AV shuttle will travel a 5-mile route, its longest to date, along the Woonasquatucket River corridor with 12 stops, from Olneyville to Providence Station. The “Little Roady Shuttle,” as it’s being called, can carry up to five passengers and an attendant. The vehicles began testing this week on low-volume roads as the initial phase of a pilot project scheduled to launch this spring. Malek said a curious thing to me when we last spoke. In the midst of explaining the differences in complexity between its route in Detroit and Rhode Island, she referred to May Mobility as a transportation service provider. That’s not unusual, this is an AV shuttle company after all. Except that unlike so many AV startups, May Mobility seems to put the transportation service part ahead of, or at least on equal footing, with its AV efforts. Malek also told me that May Mobility will continue to expand into new markets and double down on places it’s already operating, which includes Columbus, Ohio and Detroit. Thanks for all the tips everyone. I’ll be vetting these over the next few weeks or so. We’ve heard from a couple of sources that top engineers are fleeing one of the larger self-driving car startups. Poaching between AV startups is common. We’re looking into whether something else is at play. Also … not a tip, but something worth tracking, and perhaps a tidbit that not everyone noticed. Under the Flexport-Softbank deal, Softbank’s Michael Ronen will join Flexport’s board and director Ed Shrager comes on as a board observer. Here’s the interesting part: CEO Ryan Petersen will retain majority control of the company, as Forbes reports. That’s notable considering investors are giving up so much control to founders, even while drowning them in capital. Another day, another Softbank Vision Fund deal. This time, Softbank led a $1 billion funding round in Flexport, a San Francisco-based full-service air and ocean freight forwarder. Logistics” they’re so hot right now. If Amazon is the Derek Zoolander of logistics, perhaps Softbank is Hansel. Just go with it. Softbank put $2.25 billion into self-driving car startup GM Cruise last year. It is also backing ride-hailing companies Didi and Uber, peer-to-peer car-sharing company Getaround, Alibaba Local Services, DoorDash, Full Truck Alliance, Grofers, autonomous delivery robot startup Nuro and ParkJockey. Transportation and logistics are massive markets that are being disrupted by technology. Ride-sharing companies have used mobile computing and AI to create a whole new market for moving people and goods. We see additional opportunities in long-haul trucking, warehouse management, robotics inside and outside warehouses, last-mile logistics (including parking), and other areas. We believe the opportunities to modernize these pieces of the value chain are very significant and still largely untapped. Similar to the shift in TV and media consumption to on-demand and on-the-move, consumers are more and more expecting to get what they want, when they want it, where they want it – with little to zero delivery costs. Amazon has created a massive ecosystem to enable such an experience. The rest of the world is playing catch up. We believe the companies we’ve backed are making significant strides to enable such experiences, and that there’s still a lot of opportunity ahead both in the U.S. and abroad. So it looks like it’s shaping up to be “all the transportation and logistics companies backed by Softbank” versus Amazon. Mojio, the connected car SaaS platform provider, raised $40 million a Series B round that included included a strategic investment from Assurant as well as Bosch and T-Mobile. If this image leaves you scratching your head, you’re not alone. BMW and Daimler, which had agreed last year to merge their urban mobility services into a single holding company, announced Friday plans to unify these services and sink $1.1 billion into the effort. Also this week: Daimler moves its big date platform to the cloud. TechCrunch’s Romain Dillet chimes in on what this all means. In short: a hot mess. Daimler and BMW know how to make cars, but they really don’t know how to brand mobility services. Last year, they both agreed to merge their mobility services under one roof with each company owning a 50 percent stake. But after many acquisitions and poor branding decisions, it became a confusing mess. You know how they could have cleaned up their mess? By choosing descriptive names and leaving the past behind. Instead, they’re creating five joint ventures with names that look like some services that already exist, but not quite. They’re also investing $1.1 billion in those services. The best way to avoid a headache is by looking at this chart. Each line represents a joint venture. 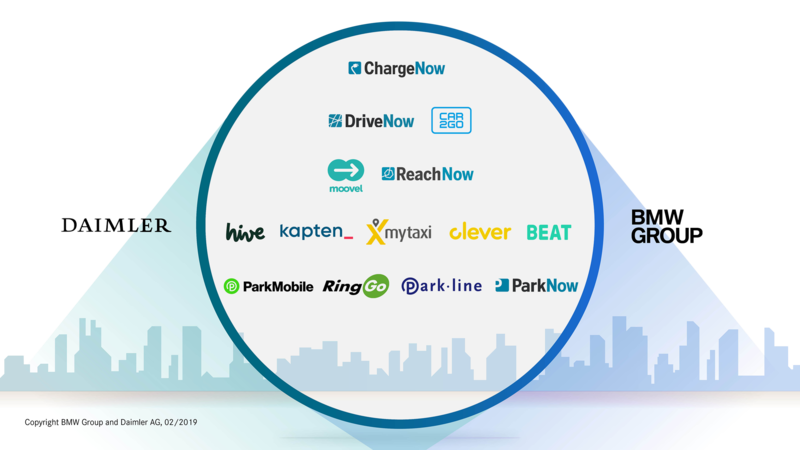 ChargeNow is now Charge Now, free-floating rental services DriveNow and Car2Go are now Share Now (yes, Drive Now wasn’t good enough), all the parking services are now unified under Park Now (that one was easy), all the ride-hailing services are regrouped under Free Now, and ReachNow and moovel are becoming Reach Now (even though ReachNow is a ride-hailing service but I give up). It gets a lot more confusing when you realize that some services will merge while others won’t. mytaxi announced that it would become Free Now, but Chauffeur-Privé just changed its name to Kapten for instance. Goodbye now. Scooters have received mixed responses in cities. But data from cities’ respective pilot programs generally show that people like them more than they hate them. A survey from the city and county of Denver, Colo. found that 32 percent of respondents (bike riders, scooter riders and non-riders) “love” scooters in the city, with 26 percent saying they don’t like them, but may like them if some changes are made. Meanwhile, over in Los Angeles, the city’s Department of Transportation received applications from 11 dockless mobility companies to operate in the city. Collectively, those 11 companies sought permission to operate 37.7K dockless bikes and scooters. For the operators selected, LADOT requires them to conform to its Mobility Data Specification, which entails the collection of data pertaining to vehicle type, trip duration, trip cost, trip parking verification and more. LADOT started accepting permit applications in January and required companies to submit by February 15. LADOT says it expects to make a decision next month pertaining to which companies can participate in the one-year pilot. One item this week. Trucks. (One side note, I was going to include Apple’s ADS report issued to NHTSA. And then I read it. Not much there except a tiny insight in what they require for their safety drivers. But in case you’re interested, read it here. A recent report from McKinsey called Route 2030 – The Fast Track to the Future of Commercial Industry report, got our attention. It charts out the rise of e-commerce and shortage of truck drivers as well as the emerging trend of autonomous trucks. New opportunities are driven by three major trends: alternative powertrains, autonomous vehicles, and connectivity. These could add another $3 billion to the profit pool by 2030. Total global OEM profits to increase by $5.6 billion to about $18.3 billion by 2030, resulting in a slight industry profitability increase from 6.6 percent in 2017 to 6.7 percent in 2030. Wired’s take on self-driving car jargon; The Information’s organizational chart on GM Cruise; and Lytx, which provides fleet management services like video telematics and vehicle tracking for fleets, crunched data that identifies the top 10 roads for cell phone use in the U.S.
Deployments don’t always mean AVs. This week, Berlin’s public transit authority, BVG introduced Jelbi. What is a Jelbi? 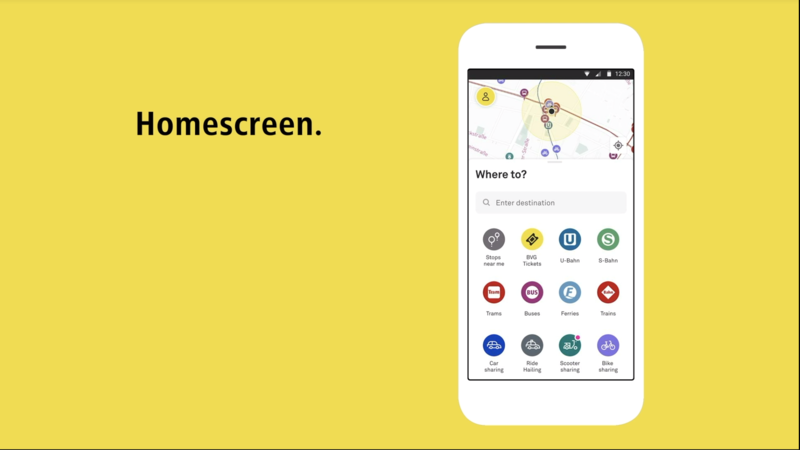 It’s is a mobility app (powered by technology from Trafi and branded under BVG) that is designed to cover all the ways people travel, including by public train and bus, bike share, car-sharing, scooters and ride-hailing. These one-stop mobility apps are a bit like rainbows. We can see them and they’re beautiful, but they don’t last. That’s not to say they’re not valuable. THEY ARE. Seamless travel for everyone from Point A to Point B is the goal. But some struggle to get every mode, or every competitor within a particular mode, onto one app. Sometimes the app just isn’t so great. Or it’s great and no ones knows about it. In the case of Jelbi, it looks like it’s off to a good start. People tell me that BVG and Trafi want to get 25 providers onto the app. So far, they have about 15, including Cambio, Emmy, Lime, Jump, Mobileeee, Miles, Mobike, and Taxi Berlin to name a few. Will the new combined and confusing Daimler-BMW joint venture add its Berlin-based services to the app? We’ll watch for it. The Geneva Auto Show is coming up and there will be no shortage of electric vehicle concepts. Volkswagen, Peugeot, Kia are teasing them. But there’s one reveal preceding Geneva that TechCrunch is particularly interested in and that’s Polestar. I met Polestar CEO Thomas Ingenlath in August during Monterey Car Week. I meet lots of passionate CEOs and co-founders. And Ingenlath didn’t disappoint. As we chatted over dinner I was struck by his design background and his ideology. Ingenlath is a car designer by trade and he had some interesting ideas about what people want and what works. On Feb. 27, Polestar is going to live stream an unveiling of the Polestar 2, the first fully-electric car from the Volvo Group and the world debut of Google’s new in-car HMI system. Just set your alarm (for U.S. and Canada folks) and head to their website. The reveal starts at 4 am PT.